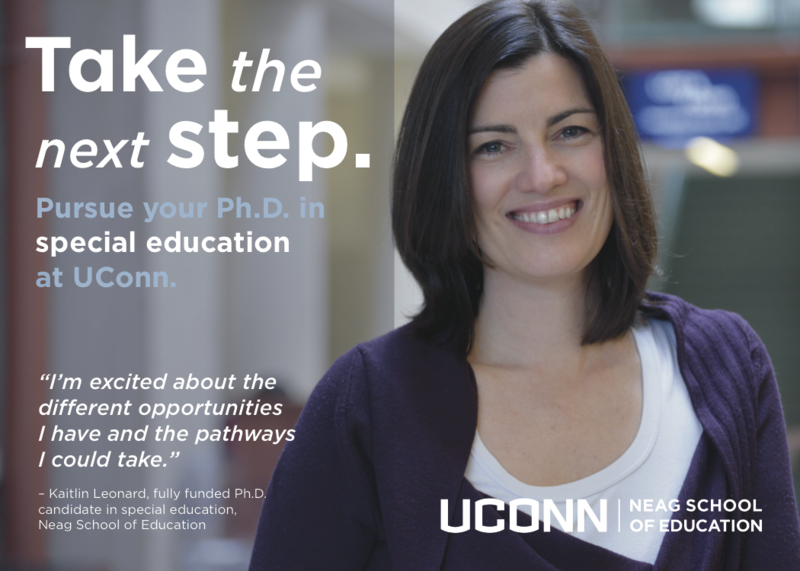 There has never been a better time to pursue a Ph.D. in special education at UConn’s Neag School of Education. Immersion in research. Gain hands-on research experience working alongside special education faculty who are among the nation’s top experts in the field. Career opportunities. Shape your professional future, whether conducting research at a major research university, influencing policy, or teaching the next generation of special educators. Sought-after expertise. Acquire in-demand knowledge and skills in the most critical areas in special education including literacy, behavior supports, and transition. National reputation. Join an outstanding special education program ranked consistently in the top 15 by U.S. News & World Report. Funding for full-time students, including tuition and a generous stipend, are now available. 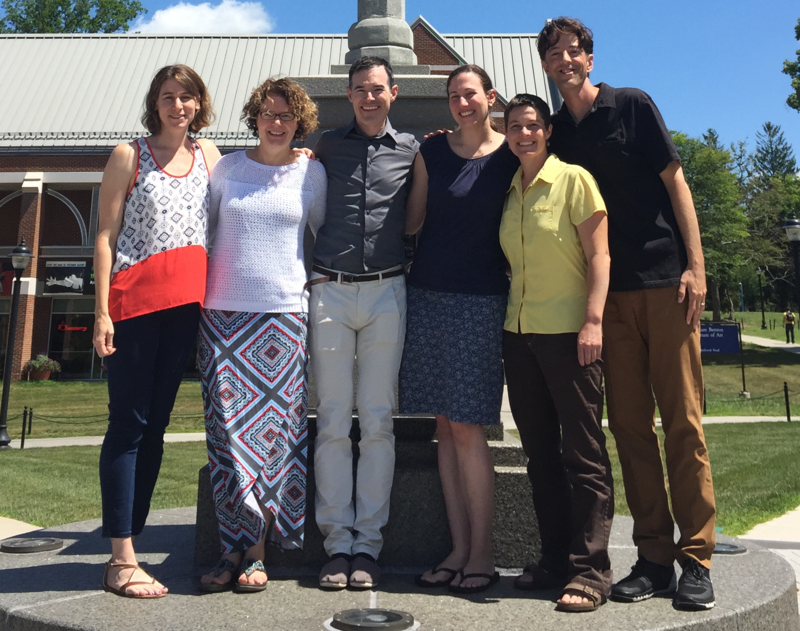 Apply to the Neag School by Dec. 1, 2017. Ph.D. students in Special Education engage in a highly individualized program of study that includes coursework and applied competencies in four broad areas: a) Knowledge and Content, b) Research and Scholarship, c) University Teaching and Professional Development, and d) Service. Ph.D. students focus their studies in one of four primary areas of emphasis. Ph.D. students focusing on Positive Behavioral Interventions and Supports collaborate with faculty on research and study related to behavioral theory, designing and evaluating effective instruction and intervention for students experiencing behavioral difficulties, developing and implementing effective classroom management supports for teachers, and supporting school, state, and regional efforts to implement effective multi-tiered systems of support for behavior. Receive funding for four years of full-time study with our nationally recognized faculty in the areas of literacy supports, positive behavior supports, or postsecondary transition through a new doctoral leadership grant funded by the U.S. Department of Education. Fellowships include tuition, a generous stipend, health and dental insurance, and funds for travel and research. The definition of “nexus” is a “means of connection.” Therefore, the goal of Project NeXus II is to serve as a means of connection between the most promising future scholars and the field of special education. Additional funding opportunities are available through faculty research projects. Connect with a potential advisor for more information. Ph.D. students focusing on Postsecondary Transition engage in research and practice related to effectively supporting students with disabilities in their transition to, and success in, post-secondary life. Coursework and research experiences emphasize collaboration between secondary schools and postsecondary institutions and between Offices for Students with Disabilities and other campus services. The program also emphasizes person- centered planning, self-determination, the legal aspects of postsecondary services and secondary transition, and assistive technology. Ph.D. students focusing on Early Childhood Intervention engage in study, research, and practice related to effectively supporting infants, toddlers and preschoolers with disabilities and their families. To this end, students participate in doctoral coursework, interdisciplinary seminars, supervised and individual research opportunities, individual mentorship, and internships in federally funded centers including the A.J. Pappanikou Center for Excellence in Developmental Disabilities Research, Education and Service (UCEDD). Areas of emphasis include personnel preparation, research, scholarship, policy application, and community engagement. Our commitment to doctoral education is to inspire and prepare professionals in special education to create and broaden opportunities for individuals with disabilities. Students are encouraged to develop their interests in educating learners at risk across a wide range of disabilities incorporating a lifespan perspective. The Doctoral Program is designed to enhance independent thinking and leadership qualities through an individualized program embedded in a thorough knowledge of theory and the existing literature and culminating in active research to guide, direct, and inform the field.